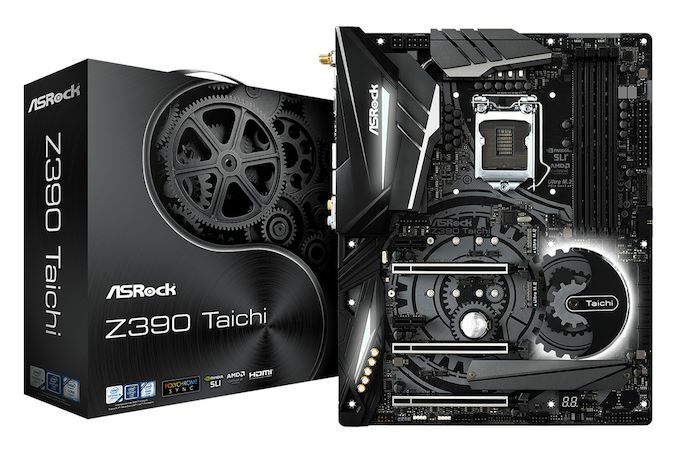 The Z390 Taichi is quite similar in specification and design in comparison to the ASRock's previous Z370 Taichi which we reviewed in July with an upgrade. 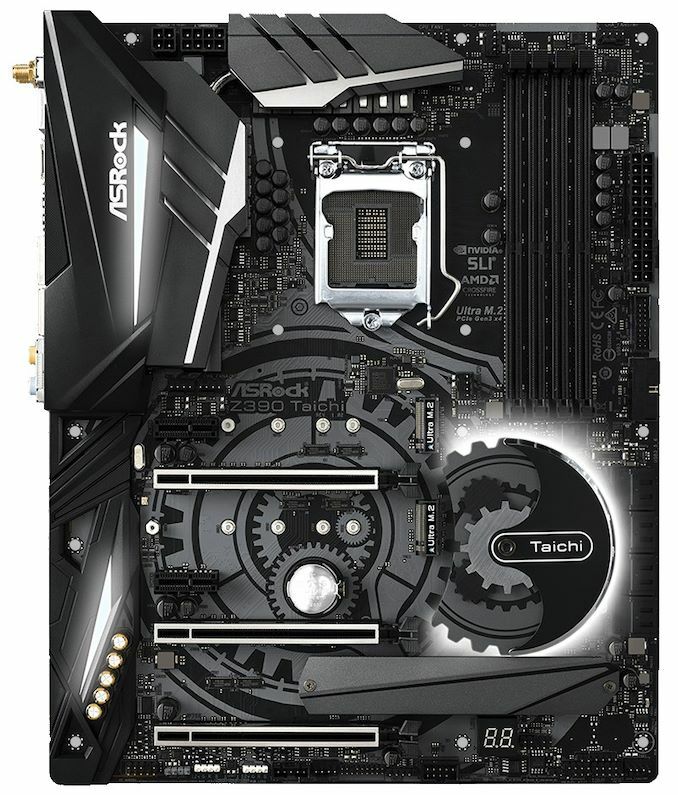 First of all the chipset heatsink on the newer Z390 Taichi resembles that of the one we saw on the ASRock X470 Taichi Ultimate with the design similar to that of a working cogwheel. 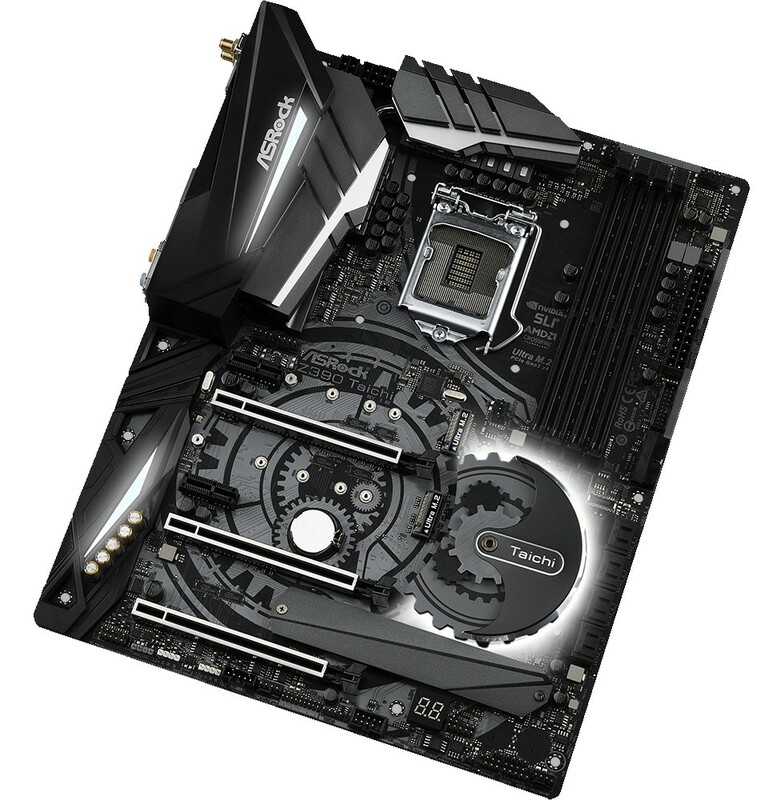 Even the power delivery heatsinks look noticeably bigger than the previous Z370 variant with ASRock using a similar 5+2 power delivery to the Z370 Taichi, but with different componentry. One of biggest design upgrades ASRock has improved over the Z370 Taichi is the extended rear panel cover which covers the PCB gap between the rear IO and the power delivery heatsink; this does look much better visually. In regards to what's new on the ASRock Z390 Taichi, a solid looking 10-phase power delivery with an IR35201 8-channel PWM controller operating in a 5+2 configuration. The CPU VCore section is made up of ten Texas Instrument 87350D NexFET power blocks which are doubled by IR3598 dual drivers. Each individual phase is complemented with a dedicated 60A choke and the Z390 Taichi uses 12K capacitors throughout. It is worth noting that the ASRock Z390 Taichi, the ASRock Z390 Taichi Ultimate and the more gaming focused ASRock Z390 Phantom Gaming 9 all feature the same power delivery across all three models. So, wait. Do all three M.2 ports (if populated with NVMe drives) disable SATA ports or does M2_2 only disable SATA ports if its populated with a SATA drive? The first m2 can block between 0 and 2 SATA ports depending on how other IO lanes are configured. The second M2 will block 2 SATA ports. The third M2 slot can't do SATA, and won't block any sata drives. "*M2_1, SATA3_0 and SATA3_1 share lanes. If either one of them is in use, the others will be disabled. M2_3, SATA3_4 and SATA3_5 share lanes. If either one of them is in use, the others will be disabled." I really wish we could get some in site to the sub components of motherboards. Things like, what's the performance of the m.2 slots when all 3 are configured? How about usb transfer speed tests. Some sound testing? Wi-fi tests. Any issues with dual nic's and teaming?